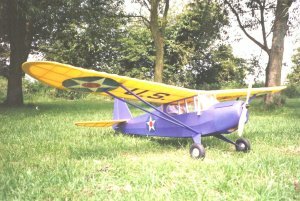 Home :: Kits :: Scale Kits :: Taylorcraft 057 - 70"
The 70 inch Taylorcraft 0/57 is based on the 48 inch version originally designed by Earl Stahl. It can be finished in many semi scale ways to give an easy flying model which is a nice introduction to scale modelling. The kit contains pre cut wing ribs, tip shapes and formers, balsa sheet strip and block wood, a pre formed undercarriage (needs joining and final assembly) full size plans, hardware pack and window glazing material. Everything needed to build the basic airframe of the model.